NOW BOOKING FOR THE 2019/Early 20' SEASON!!! W.T.H.O. 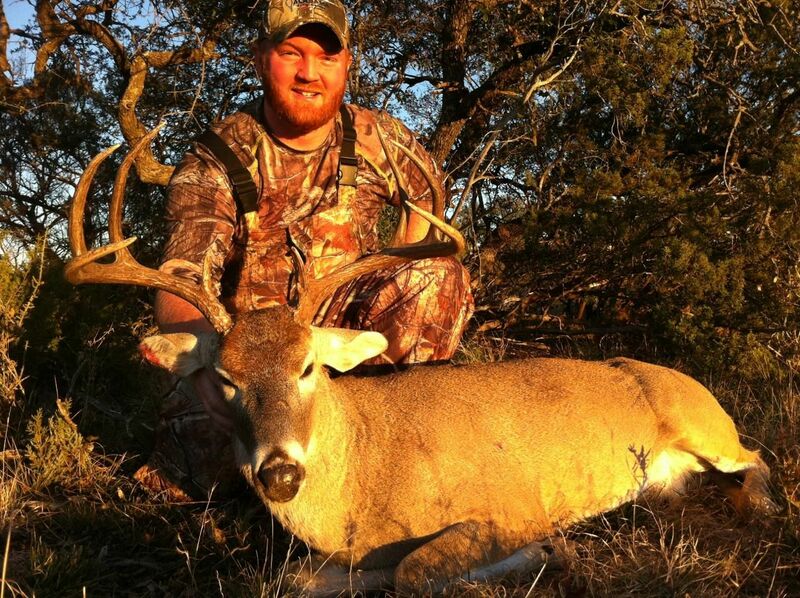 offers great Free Range Trophy & Management Whitetail hunts in west Texas. Archery or Rifle hunters are welcome with MLD hunts available on some properties. Doe package hunts can be created for single hunters or groups. Los Cuernos Ranch Trophy Whitetail (MLD )- 3 Day Guided Hunt - Now Booking for the 2019 Season! the property is MLD allowing our hunters to use our state issued tags and an extended hunting season. Onsite cold storage with clean comfortable lodging that can accommodate 1 to 6 comfortably. Elevated and Ground blinds in place for both Archery & Rifle Hunters. A very healthy deer populations on the property with plenty of Rio Grande Turkey and free range Axis. Terrain consist of mild hills with large Oak & Pecan draws with mesquite flats providing a vast habitat for wildlife. A Mature Buck on this property averages Mid 130s to Mid 140s with a few low to mid 150" class deer harvested each year. There is a good road system throughout the ranch allowing for safari style hunting when applicable. Additional days will be added to groups and corporate packages are available for this property. Please inquire for more information. References to this ranch can be found at the bottom of the Booking/Contact Us Page. Doe Hunts and Cull Buck Hunts also available, POR. 1,600 acres (to hunt) on the Schleicher/Crockett county line just north of Ozona Texas and just west of Eldorado. This is a family owned ranch totaling over 4,000 acres with a main house and guest house/cabin for our hunters. The Cabin is cozy and clean with 4 beds, small kitchen and a Pool Table. Terrain on the ranch is gentle rolling hills with Oak and Cedars along with Mesquite flats and large draws. The diversity of the terrain allows hunters to try out different methods and tactics. The rut on the Highlonesome is usually around the first week in December and the rattling action on this ranch is top notch. The ranch is game managed with year round water and supplemental feed when needed although the 2017 season has blessed us with great rains and good grass. The deer population is good on this ranch and a Mature Trophy deer will average 130" with a 140" Buck not out of the question. Hunters can sit around the Fire Pit in the evening and listen to Paul play his Guitar or just enjoy being away from the Big City life. This is a great family oriented ranch good for a small group or even single hunter. We welcome Archery hunters during the Archery or rifle season. There are Elevated, Ground, and Brush blinds set up throughout the ranch. We do allow spot and stalk hunting and rattling when available. Feel free to contact me concerning any more information or questions on this ranch. The Consuelo is 8,000 acres located in Val Verde county near the Devils River and has just been opened to the public for the 2013 season. The ranch is heavily protein fed year round along with corn feeders and a decent road system. Don't forget the multiple watering stations and elevated blinds set up around the ranch allowing hunters to rotate hunt locations if needed. Terrain on the ranch is all large rocky hills with big grassy mesa tops and cedar hill sides. Multiple large draws and drainage's run throughout the ranch with Oaks and an occasional Mesquite. There is plenty of cover on the ranch for wildlife which also makes it hard to spot and stalk at times so our primary tactic will be to stand hunt first. The rut usually starts to kick off early to mid December. Lodging will be a clean bunk house that offers WiFi and Satellite TV, a kitchen area, and 8 beds with linens provided. An Ice machine is also on premises to keep your beverages or harvest cool. Meals & Non alcoholic beverages will be provided on your hunt. A Mature buck averages 135" to 145"+ on this property with the opportunity at larger deer a possibility. If available this hunt may also be paired up with an Aoudad hunt. This hunt will be a Rifle hunt with ONLY 5 to 6 Trophy hunts offered each year. The ranch can easily support all 6 hunters at once although it will be a snug fit in the bunk house. If you go to the Ranch Information part of the website there is more detailed ranch information, pictures, and references from our Aoudad hunters on the Rancho Consuelo. Good rains on the ranch most of the year along with heavy protein and minimal to no hunting pressure will prove this ranch to be another little honey hole. Trophy Hunt- Now Booking for the 2019 Season! Management Buck Hunt- Now Booking for 2019 Season! Diamond TF Ranch is located right outside Sonora Texas and is approximately 2,000 acres of highly game managed property. Multiple large food plots, watering areas, and feeders for wildlife support a very high population of Whitetail, Turkey, and a growing Axis herd. Hunters can expect to see 30 to 50 Whitetail in the main food plot on a good day of hunting. A good road system throughout the ranch allows for a variety of different hunting styles such as High Rack hunting, Baiting roads, Blind Hunting, Glassing food plots from a high point, or spot and stalk hunting. There is a newly remodeled cabin that will sleep 4 comfortably 5 cozily onsite that will be included in most hunts. Trophy deer will be Bucks in the 130" to 150" range possibly higher with several great younger bucks seen in the 2017 season that will be nice trophies in 2018. Management deer will be Mature Bucks (Guides Choice) up to 8 points that do not have any potential of getting bigger. There are some nice 7 and 8 points running around on the ranch! 4 or 5 Management hunts will be available each year and ONLY 1 to 2 Trophy hunts each year. A Turkey can be added to your hunt for $350. Part of this ranch is newly high fenced where we will also offer management hunts and a trophy hunt or two in the near future. Hunts are being offered for Whitetail by W.T.H.O. on the Diamond TF for the first time for the 2014 season.